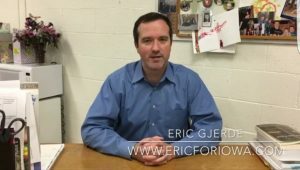 Eric Gjerde announced a challenge for a State House race by violating the law that prevents public resources to be used for partisan purposes. The Linn County teacher filmed a campaign announcement video from his desk at Thomas Jefferson High School. Gjerde is challenging first term incumbent Republican Ashley Hinson who won in November with 11,248 (62.50%) to the Democrat with 6,749 (37.50%).